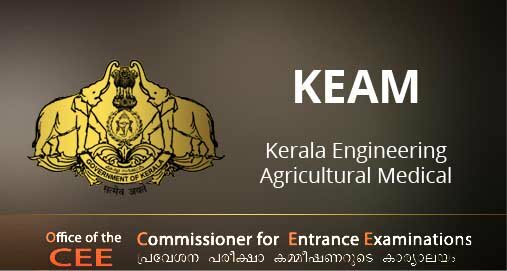 Kerala Engineering, Agriculture and Medical (KEAM ) is a state level entrance test in Kerala state. This exam is a gateway for providing admissions to professional degree courses in various fields like engineering, medical, architecture, agriculture, forestry, animal husbandry and many others. It is also referred as Kerala engineering entrance or Kerala medical entrance exam. Kerala Entrance is organized by the Commissioner of Entrance Examination (CEE), Kerala. It is conducted on the various test centres like Delhi, Mumbai, Ranchi, Shillong and Dubai (UAE). For Medical courses: Candidates must have passed higher secondary or equivalent exam with securing 50% marks in biology/biotechnology individually and 50% marks in physics, chemistry and biology/biotechnology together. application will be available online only. Candidates can fill and submit the Application Form online through the official site . The application form will be released from the first week of January, more than one form through one candidate will lead to rejection. Candidates must upload the scanned copies of their photo, signature and thumb impression in specific format while filling the application form. • Rs.500/- for SC candidates. • No application fee will be charged for ST candidates. The examination will be conducted in two papers and duration of each paper will be two and half hours. The questions will be of multiple choice questions type and based on single response. For each question, five optional answers will be given, candidates have to choose the right one only. The exam will be conducted in pen and paper based mode. Each paper will contain total 120 questions. Four marks will be given for each correct response and one mark will be deducted from the total score for each incorrect response. Engineering entrance exam will comprise in physics, chemistry and mathematics subjects and syllabus for medical entrance exam will contain physics, chemistry and biology subjects. The syllabus will be taken from Higher Secondary or equivalent examination standard. Candidates note down the questions will not be based on NCERT textbooks or any other textbooks exclusively. The CEE Kerala will release the Answer Key within a week after the date of examination. It will be published through the official website of Kerala CEE. Any complaints regarding answer key should be submitted to CEE in written with supporting documents and a fee of Rs.100/- per question before the due date. Result will be published in the fourth week of May. Result will be declared separately as medical result and engineering result. Candidates can view their results through the official portal of CEE Kerala. After result announcement, a separate merit list will be prepared for all the courses. Seats allotment will be done via Centralized Allotment Process (CAP) will be done through the Single Window System (SWS). The seat allotment will be done on the basis of ranks secured by the candidates and options filled by candidates. This process will be conducted by Commissioner for Entrance Examinations (CEE), Kerala with the support of National Informatics Centre. After seat allotment, candidates have to report to the allotted college to confirm their admission. In which mode exam will be conducted for Engineering program and I want to know about the structure of Exam pattern? exam will be held offline via Pen and Paper based mode. Exam Pattern comprises of 2 papers i.e. Paper- 1 and Paper-2. Paper-1 is for Physics & Chemistry which has total questions of 120. Paper-2 is for Mathematics which has total questions of 120. For every correct response, 4 marks will be provided. There is a negative marking system in Exam pattern, 1 mark will be deducted for each wrong answer. The duration of the exam is 5 Hours, 2 Hours 30 Minutes each. May I know, how shall I download Admit card? The candidates need to visit the official website in order to download Admit card. There will be link provided for the Admit card. The candidates need to enter into the login page and then they have to enter their Application number and DOB. Then the Admit card will be displayed in the pdf format. Then the candidates need to click on the print button in order to take the printout. Then they need to keep the Admit card safely till the admission procedure. When and where will I avail Result? The first step is to visit the official website in order to check Result. Result will be made available via online mode. The candidates need to enter their Application number to check the Result. Based on the aspirant’s performance in the exam, a merit list will be prepared. Wanted to know the process of filling Application form? Aspirants are required to visit the official website and register themselves by filling the complete details in Application form. Then they must upload the Scanned copy of Passport size photo, thumb impression and signature as per the prescribed one. The candidates need to keep the copy of filled Application form safely. Then the aspirants need to send the printed & filled application form along with required documents to the Office of the Commissioner for Entrance Examinations. Under Eligibility, May I know the requirement for Qualification and Age criteria? Aspirants should have qualified in 12th examination from recognized board for the eligibility. Compulsory subjects: Physics, Chemistry and Mathematics. Percentage Criteria: 50% marks aggregate in PCM, Mathematics individual score should be 50%. Age criteria: One must have completed their 17 years of age as or on 31st December. There is no upper age limit for exam.